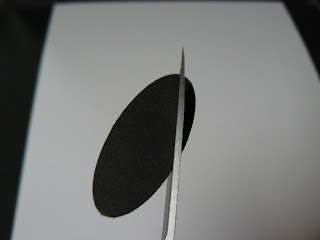 Start out with a piece of Basic Black card stock (2-1/2" to 3" strip). 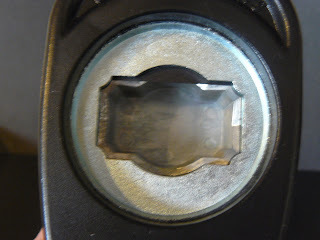 Insert it into the top of the Designer Label punch and punch out just the curved portion. 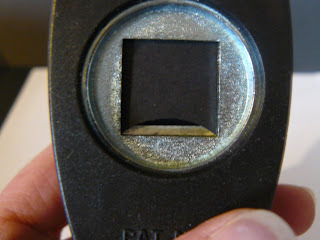 Next, punch this piece using the 3/4" square punch. 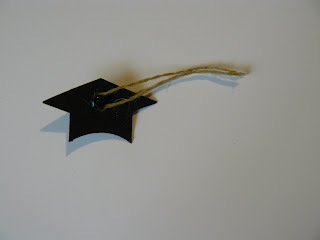 This will give you the base for your graduation cap. You will repeat this 3 more times. When you are done, it should look the following picture. 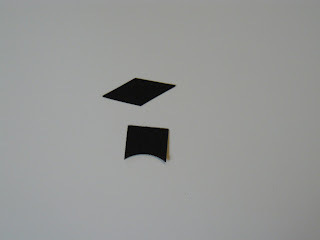 Adhere the lower portion to the top (match up the top 2 corners of the square to the top slants of the top of the hat). 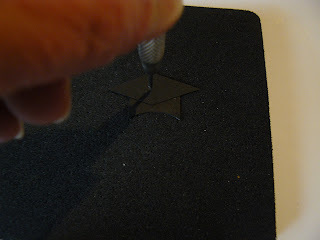 Using the paper piercing tool, pierce a hole in the center of the cap top. Into this hole, push through a black brad from the Vintage brads. Don't close the ends just yet. First you will tie a knot into a piece of thread (cord or embroidery floss would work too). It should look like a loop that has a knot at the lower end. Wrap the loop around the brad with the knotted end to the right. 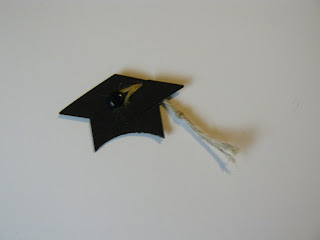 Cut a slit into the right edge of the cap's top, and pull the knotted end of the thread through the slit and toward the back. Now flatten out the ends of the brad on the back-side. I like to hammer them flat with the small hammer that comes in the Crafter's Tool Kit. You did it! Now all that is needed is to place a Stampin' Dimensional on the back and adhere it to your project.